Other than white and grey hair, all hair colours can be permanently reduced through treatments. Dark hairs are most easily treated due to the high concentration of melanin that gives maximum absorption. In order to compensate for the lower levels of melanin found in fair hair, the operator can simply raise the fluence output from the system. Does the client need to shave before the treatment? As long hairs use up the energy and prevent all of it reaching the hair root, ideally hairs should only be 1 to 2 mm long when patient comes in for the treatment. 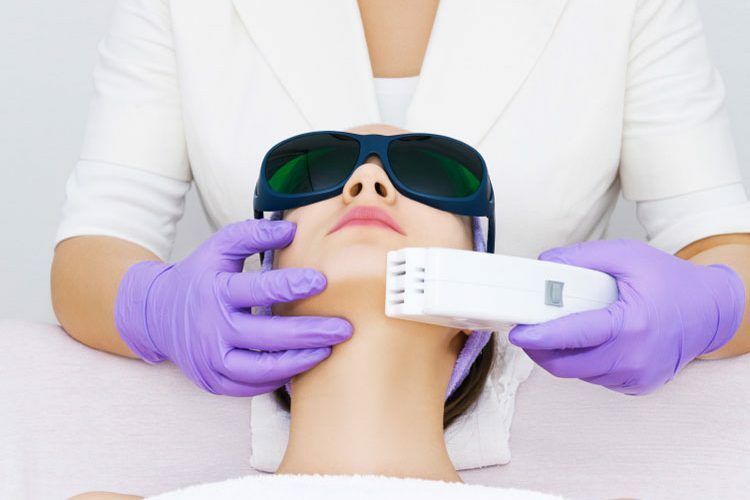 By avoiding any other form of epilation, plucking or waxing in the month leading up to the treatment, it ensures as many follicles as possible contain hair, and thus can be destroyed by the light. Additionally, bleaching should also be ceased in the weeks leading up to the termination. Why hairs grow after treatment? Unlike other light epilation treatments, hair is not vaporised by the IPL treatment. The heat kills the hair root, but the hair remains in the skin and sometimes become attached to the epidermis. Over the 1-3 weeks following the treatment, the hair will fall out as the epidermis renews itself. During this period it will seem that the hair are “growing”. How can you tell if the treatment has worked when the hairs are not removed immedietly? A few minutes after the treatment, there are various indications of the effectiveness of the treatment. These include: the colour of hair becoming charcoal, the hair expanding in size or a red ring around each follicle. These are good indications that sufficient heating of the follicles has taken place. How ever, this is not always seen and many patients have great results without the past treatment signs. The visible light is completely safe, and thus, no special precautions are needed apart from glasses for the brightness generated from the flash lamp. The skin of some patients become quite red immediately after treatment and rarely small blisters as from excessive sun exposure can occur. However, most patients experience no side effects at all, and any of the described skin reactions should disappear within hours to a few days.